We were looking for the best mats for gymnastics and came across a lot of good mats. There are some, in particular, that stood out as the best. Qualities like cushioning, grip, and portability were all considered. We narrowed down our list of favorite gymnastics mats to the top 10 gymnastics mats for sale. Another quality we looked for in these mats was a reasonable price. So, we will talk about the best cheap gymnastics mats for sale as well. The low price of these exceptional gymnastics mats shows that superior quality doesn’t have to be expensive. We’ll start by telling you about our top recommendation, then we’ll have a comparison chart to help you compare the mats. After that, we’ll get into our individual reviews of the best gymnastics mats for sale. We’ll look at cheap gymnastics mats for home and even look at some gymnastics mats under $50. Our favorite mats were from We Sell Mats. Specifically, we liked the We Sell Mats Gymnastics Tumbling Exercise Folding Martial Arts Mats with Hook & Loop Fasteners. The price is reasonable and the quality is high. These mats are made of tough materials that stand up to punishment. These mats are incredibly resilient and stand up to a lot of use. They also come in a variety of colors so you’re more likely to be able to match your team colors. Matching your team colors is great even for home use. There are other great things about these gym mats, and you can find them below in our full review. Suffice it to say, we found them to be fantastic mats to use for gymnastics. First, let’s compare the top 10 gymnastics mats for sale in our chart. 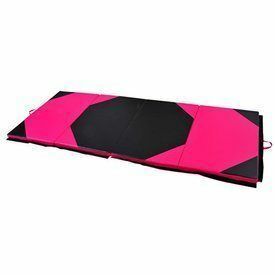 The We Sell Mats Gymnastics Tumbling Exercise Folding Martial Arts Mats with Hook and Loop Fasteners are the best mats for a number of reasons. First, they come in multiple thicknesses and colors. That means that you can have a mat at home that is the same thickness as the one that is acceptable in competition. There are 18 color options for this mat and more than one thickness available. The mats aren’t just made for gymnastics. They are also useful for other activities like parkour, martial arts, yoga, pilates general exercise, and stretching. The best part of these mats is the material of which they are made. They’re made of high-quality polyethylene foam. They don’t contain toxic materials like lead, formaldehyde, or phthalates. They’re also made of industry standard vinyl. The mats can be connected together with the Velcro that is present on all four sides of each mat. We tried out these mats and found that they are non-slip and are easy to put together. We used 4 mats and they stayed together even when we did cartwheels and other tumbling on them. The IncStores Tatami Foam Tiles are great for many types of workouts. If you need gymnastics mats under $50, these could be the right mats for you. Each mat fits like a puzzle piece with the others so it’s easy to add more mats. You can buy the mats in groups ranging from 4-60 tiles ranging from 24-240 sq. ft. It can be used as flooring for your entire home gym. The foam in these mats is closed cell EVA foam which is high-density. The tiles are reversible and can have a different color on each side. One thing everyone appreciated about these mats was the ¾” foam. It’s common to find 5/8” foam which is much less padding that is needed if you fall while tumbling. It doesn’t come in as many colors as our favorite products, but there are a lot of options for sizes. We chose the 24 sq. ft. option. it was fun to use and our gymnasts appreciated the thickness of the foam. One gymnast had a fall during an exercise and the foam was thick enough to protect him from injury. 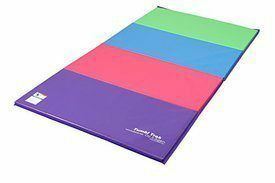 The Tumbl Trak folding Gymnastics Mat is a favorite because it is available in many colors and uses Velcro to attach to other mats. These are also very portable mats. They have folding panels that are 2 feet wide making them easy to fold and transport. Another thing we love about this mat is the value for the price. While it doesn’t have as many colors as our favorite mat, it is 1-3/8” or 2” in thickness which makes it safe for tumbling, cheerleading, and more. The vinyl on these mats is also of superior quality. While many other mats have laminated vinyl, these mats are made of 18oz knife coated vinyl. That makes them more durable than a lot of other mats at the same price. So, the value of these mats is very clear. You can use it unfolded to practice cartwheels and folded to practice diving forward rolls. 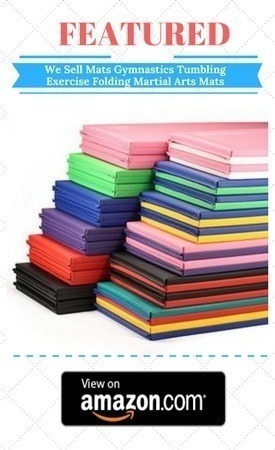 Foldable mats are very useful for adjusting thickness for different exercises. If you need to switch between trying a new flip to doing a handstand, these mats are right for you. It comes in many different colors but doesn’t have the same quality foam as our favorite mat. It was still among our favorite cheap gymnastic mats for sale. The Z-Athletic Gymnastics, Tumbling, Martial Arts 4 Sided Velcro Folding Mats are great multipurpose mats. These mats are low priced and come in a variety of colors and sizes. The Velcro provides a secure hold so that the mats stay together exceptionally well. The non-slip surface was particularly noticeable compared to some that didn’t make our list. Slipping can cause injury. These mats are a great idea if you are concerned about safety. The Velcro on these mats can help them stick to carpet without shifting. That makes them safer and easier to use than mats without Velcro. The cushioning of these mats is from the closed cell high-density polyethylene foam. That makes them strong and safe to use. Most of our gymnasts really liked these mats. They are lightweight enough to be carried easily even though they don’t have a handle, we were able to transport them easily. 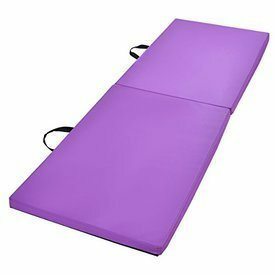 The Giantex Gymnastics Mat is available in purple and blue. It is 1.5 inches thick. This mat provides adequate cushioning for many fitness applications. The mats can also be used for regular cushioning on a bed or seat. Because they’re portable they can easily be taken to a sporting event and then used as a seat cushion. While the quality of the material isn’t as high as some of the others, it has a great price. This mat is narrow so it is best used for practicing some basic gymnastic moves that don’t require a lot of space. Another application of this mat would be as a safety precaution for toddlers that might fall out of their crib or bed. Then, when your child is older, they’ll have a mat for martial arts or a little practice tumbling. It’s made of PU Cloth and EPE Pearl cotton. It’s not the same superior quality vinyl that our favorite mat is made of, but it serves its purpose as a mat for small children. The cushioning makes it safe and the size makes it portable. We recommend this as a great small multipurpose gym mat. It may not have dense foam, but it has a great price. The Bestmart INC 2’x6’x1.2” Thick Folding Gymnastics Gym Exercise Mats for Stretching Fitness and Yoga are an exceptional value. While they don’t use vinyl, they use environmentally friendly PU cloth like the Giantex mat. The Velcro in the edges means that you can connect multiple mats together unlike the Giantex mat. The material inside this mat is EPE pearl wool. This mat and the Giantex mat are eco-friendlier than some of the others because they don’t use vinyl and other plastic derivatives. We were hoping they would be equal in quality to the vinyl mats, but they aren’t quite as durable or slip resistant. We liked how easy it was to use these mats and put them together with other mats. Because the hold was secure, we were able to make a large safe surface for gymnastics practice using these mats. Our teen gymnasts really put these mats to the test, the moves they tried made us cringe in expectation of a seam coming apart, but the mats held up well. The price of these mats starts at under $50 each making them an amazing value. We recommend buying multiple mats and putting them together to give your gymnasts room to move. The low price of these mats makes that an affordable option. They Z-Athletic Gymnastics Cartwheel/Beam Training Mat has imprints on it to help children learn to do cartwheels and the balance beam. On one side you have hand and foot placements for cartwheels and on the other side, you have a beam imprint for safe balance beam training. This mat comes in 3 colors and is 1.5” thick. That makes is a safe mat for practicing cartwheels. It’s typically priced around $60 and we think it’s a great value. This mat doesn’t try to be more than it is. It’s a simple practice mat for cartwheels and beam training. The mat is made of durable vinyl and is non-slip. That makes it safe and durable. This mat is made for small children just starting out in gymnastics. It’s 6’x2’ which makes it too short and narrow for older children. We suggest you buy this for kids 7 and under. The hand and foot imprints are perfect for a child around the age of 6, but they can use the mat until they are 8. After that, you might want to invest in something larger. Because this mat is meant for cartwheels and balance beam training specifically, it doesn’t have Velcro to allow connection to other mats. 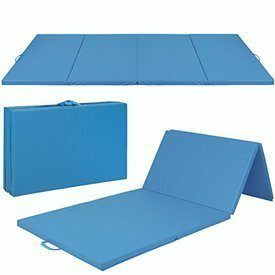 The Best Choice Products 4’x10’x2” Gymnastics Gym Folding Aerobics Mats for Stretching and Yoga are easily portable mats. We liked the 2-inch thick EPE foam. It’s made of PU leather which is eco-friendly, but not as durable as vinyl. It’s available in 3 colors. The size of this mat makes it more usable by older gymnasts. It’s 10’x4’ so it’s wide enough and long enough for a teenager to practice cartwheels. When folded, it can be used for exercises that require an even thicker mat. This mat is not easily connectible to other mats so if you need a larger surface than what it offers you should look elsewhere. However, we did find it to have adequate size on its own for a variety of purposes. This mat is made of 4 foldable panels. It’s easy to fold and transport. If you have a young gymnast in your house, this is the mat for you. It can be easily put away after each use and it’s strong enough to handle whatever your gymnast throws at it. The Soozier PU Leather Gymnastics Tumbling/Martial Arts Folding Mat is made of PU leather and is 2” thick. 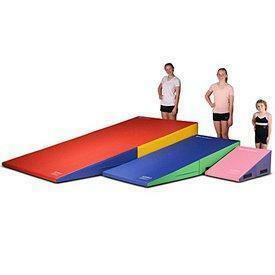 It has high-density EPE foam making it a good safe mat for gymnastics practice. While we don’t love PU leather because it doesn’t seem as durable as vinyl, these mats were great. They are connectible to other mats so we put them together and let our gymnasts try them out. The cushioning was excellent. While PU leather may not be the best material, it is puncture resistant. We found this mat to be more durable than expected from PU leather and we loved using it. This mat is available in multiple colors and patterns. If you’re looking for a solid color you will have the options of blue or mauve. Otherwise, there are stripes and shapes to choose from. One benefit to this mat is that because it’s PVC free it doesn’t have to be aired out for as long after you remove the packaging. Vinyl mats may need to be aired out for days after purchase so that the smell of the vinyl dissipates adequately before use. The ECP4Kids 4-Section Tumbling Mat Is a nice small mat. You can buy it in sizes from 4’x4’-4’x8’. It uses Velcro connectors and is 2” thick. It only comes in one bright multicolored pattern. We put a few of these mats together to make a nice sized surface. The vinyl was durable and the Velcro held the mats together adequately. The foam is dense enough to prevent injury. It’s made for children 3 and up. We suggest that it might not be the best mat for teens and adults, but it’s great for children. This mat folds in half but isn’t very compact for storage. When you have a lot of mats, it’s good if they can be stored easily. These are great cheap mats for gymnastics. These mats are ideal for tumbling. We had some 5-8-year-olds try out these mats for tumbling and they held up well. They seemed perfect for this age range. When a teen tried them she found the foam to be inadequately dense and two panels slipped apart. There was no injury, but these mats seem better suited for children that won’t push their limits like a teen. We still liked these mats, just of a limited age range. Material- Mats made of PU leather are more eco-friendly, but not always as durable as vinyl. Make sure to get a non-slip surface. Another consideration with a non-slip surface is that you don’t want it to go overboard and be abrasive. We didn’t include any abrasive mats on our list, but it is something to watch out for. Size- Make sure you’re buying a mat that is the right size and thickness for what you will be doing. Also, if this is for competition, make sure it meets the regulations of your association before you buy. Some mats may be too thick or too thin to qualify for use in all applications. Connectible- If you need a large practice surface, buy mats that are easily connectable with Velcro. Make sure there are Velcro connections on all sides of the mat so you can expand the size as much as you need. The quality of the connections is key. Look for mats that connect easily to each other and won’t let go. Hook and loop connections are great. Also, make sure you keep those Velcro/hook and loop connecting points clean so they don’t lose their grip. Colors- There are some mats that come in a variety of colors so you can match your team colors. There are also mats with imprints on them to help train young gymnasts to do cartwheels and other exercises. However, mats with imprints for training may not always be connectible. Age appropriate- Some smaller mats are perfect for young children, but if they aren’t connectable to other mats, they will have a limited time of use. Easy to store- Mats that are dense, but flexible are great. Look for mats that can be folded and stored easily. That makes them good for competition and for multipurpose gyms that require the mats be pulled up and stored on a regular basis. Dense Foam- The thickness of the foam you use is not the only important consideration for safety. The density of the foam is extremely important. A dense foam mat is easy to walk on but will provide adequate cushioning for your gymnast. Your gymnasts need both stability and cushioning. That can only be found when using high-density foam. If the mat is really good quality, the foam will also me flexible and make storage easy. You can have both dense foam and flexibility if you find the right product. We highly recommend the We Sell Mats Gymnastics Tumbling Exercise Folding Martial Arts Mats with Hook & Loop Fasteners because it stood out as having the best quality to price ratio of any of the products we tested. It is connectible so you can buy as many as you need. These durable dense foam mats are safe and ready for impact. They are also non-slip which makes them a safe choice. They aren’t the cheapest gymnastics mats for sale, but they are the best value. We gave the We Sell Mats Gymnastics Tumbling Exercise Folding Martial Arts Mats with Hook and Loop Fasteners a 9.5 out of 10.